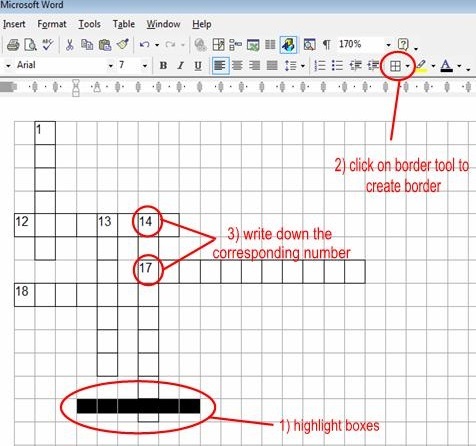 So you want to learn how to make your own crossword puzzle for any occasion? Well, you’ve come to the right place. 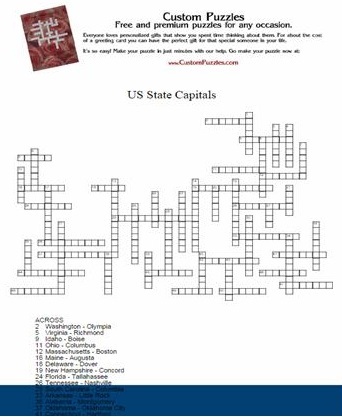 Making your own puzzle is easy these days with a reliable, free online crossword puzzle maker. You simply enter your clues, the answers, click a button and voila! You get a fully functional, printable crossword puzzle. 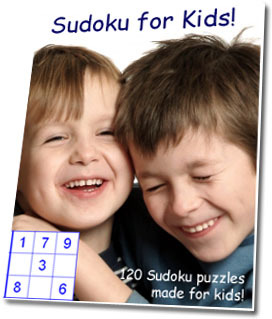 But, as with any free product, there are limitations on what you can do – for example, for our kids puzzles, we like to include a lot of fun graphics and use our own fonts and layouts. For this, you would need to purchase the full upgrade which can run around $30-$40. 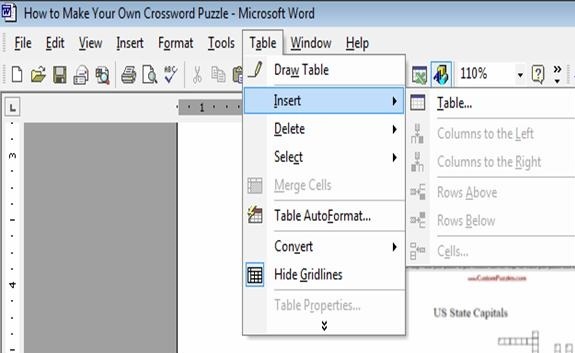 Which is fine if you are looking to generate a lot of puzzles, but if you’re only doing this occasionally, then there is an alternative way to get awesome customized puzzles using Microsoft Word in addition to the free online crossword puzzle maker. It does mean a little extra work, but personally, I think it’s worth it to get a puzzle to look exactly how you want it to. Plus, it’s free! 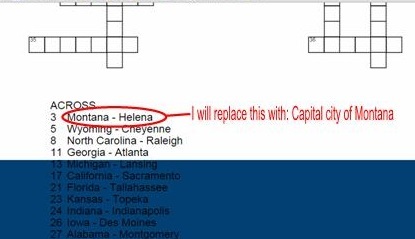 1) Open up to an online crossword puzzle maker. Our favorite puzzle maker can be found at Puzzle-Maker.com. 2) Enter a simple title. Don’t worry too much about it since we will be editing this later anyway. Just put something that reminds you which puzzle this is. 3) Enter your words & clues in the format stated. In this case, it is Answer word / Clue. I like to list down all my words first for both the “answer word” and “clue” section just so I can generate the puzzle quickly. This way, I can take my time to make up tricky clues later. However, this is simply a preference and you may choose to do it all in one step here. For a good-sized puzzle, I would recommend at least 12 words. 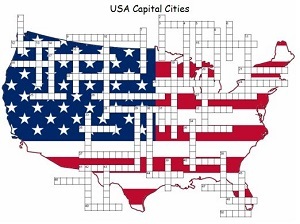 Here’s one I’m doing for the U.S. Capital Cities, which will be 50 clues and make a really nice study puzzle. 4) Once done, click the “Create Puzzle” button. This will take you to three options. Select that FREE tab, then click on the Print/Next button on the left hand side. 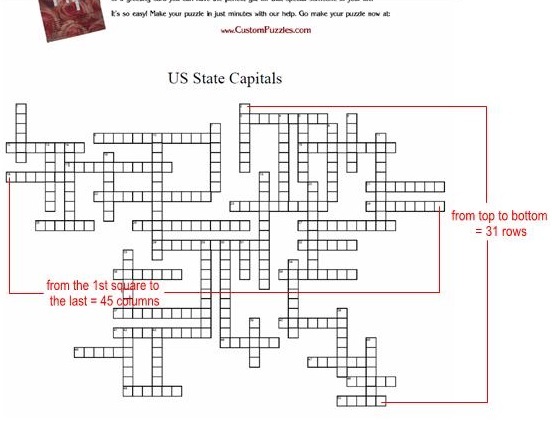 Follow the prompts until you get to the completed puzzle page that looks like this. See what I mean by not really nice looking? 5) Go ahead and print this to PDF and save to your local hard drive. Make sure to print the solution page as well. 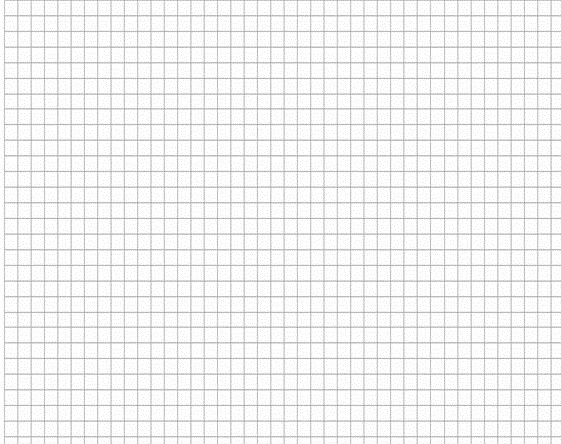 6) Open the PDF to determine the number of columns and rows. Do this by starting from left to right and counting the number of squares across, then do the same from top to bottom. In the example below, we have 45 columns and 31 rows. 7) Open up a new Word document and insert a table with the correct number of columns/rows as above. 8) Next we recreate the free puzzle by highlighting boxes and putting in the borders. Using the PDF as a guide, follow step 1 thru 3 per diagram below. 10) Finally, since it’s a word document, you can format it as you please. Have fun and feel free to insert images, add color or change the background. Just as good as the paid version. And that’s all there is to it. A little fiddly, I know, especially if you have a huge puzzle like I did with the 50 clues. But the end result is definitely worth it – check it out. Of course, if pressed for time, you can’t beat the convenience of the paid software. Puzzle-Maker.com allows you to pay per puzzle, which is great for one-offs. But if you are going to be creating puzzles on a regular basis, I would suggest purchasing a fully paid version to download to your desktop. 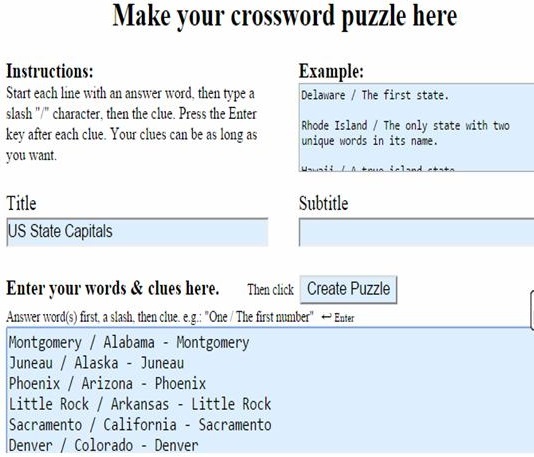 My #1 recommendation in this case is Crossword Weaver, which runs for US $39.95 or US $29.95 with an educational discount. They even offer a package version which generates wordsearch puzzles as well. I hope you’ve found this tutorial helpful, and thanks for stopping by! I think one of your advertisements triggered my web browser to resize, you may well want to put that on your blacklist. Apologies for that. Not sure how it might have happened but I’ll get our support team to look into it. Cheers! Techozoic 2.1.1 by Jeremy Clark. | 37 mySQL queries in 0.545 seconds.